Plainview began as a tiny settlement in 1856, midway between Rochester and the Mississippi River landing at Wabasha. The first area Masses were offered in rural homes by priests travelling on horseback from St. Felix Church in Wabasha. Fr. Felix Tissot first offered Mass at an Oakwood home in 1858, and then several times yearly at a farmhouse near Theilman. Plainview Catholics next attended St. James Church in Oakwood, completed in 1867, and served by Fr. James Trobec of Wabasha. Soon Fr. Trobec held Masses at the Richard Shaughnessy home in Plainview. The town and congregation grew, especially when a railroad arrived in 1878. In 1881, Fr. Trobec was replaced by the newly-resident priests of Conception, beginning with Fr. Peter Jeran and Fr. Benedict Reinhart. They offered the Plainview Masses monthly. In 1883, Fr. Patrick Murray became Pastor of Conception, serving Plainview and Oakwood as well. His Masses at the Shaughnessy home now overcrowded. Bishop John Ireland of the St. Paul Diocese had visited Plainview in February that year, and urged local Catholics to build their own church. Fr. Murray then appointed laymen to locate property for the new church. As a gift to the congregation, he purchased it himself on July 28, 1883, and transferred ownership to the Bishop. The property was large enough for a church and a rectory. The first church, called St. Joachim, was a small wooden structure. Built in May 1886, it was dedicated by Bishop Ireland on December 24, 1887. He was assisted by Fr. Murray (now its resident Pastor) and Fr. Joseph Cotter (who became the first Bishop of Winona in 1889). In 1889 a parish cemetery was added, and a church bell (still in use). The parish grew after Oakwood’s church burned down in 1892, and as Plainview surpassed one-thousand people at the turn of the century. The church was slightly enlarged by Fr. John Parkinson, who became Pastor in 1900. Fr. Daniel Lavery followed him in 1908 and decided to replace the wooden church with a larger brick structure. 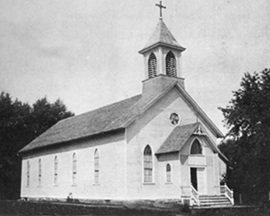 In July 1911, construction began on the new church. 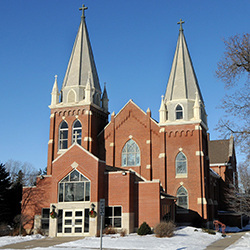 It was dedicated on June 27, 1912, by Bishop Patrick Heffron of Winona. Expansions have included a basement hall (1915), parking lot annex (1956), elevator extension (1985), narthex (1993), and carport (2007). The parish added a new rectory in 1918 and a catechetical center in 1958. Since 2008, St. Joachim’s pastors have also served Immaculate Conception Parish, Conception (Kellogg). This is a fitting return, since Conception’s priests originally served Plainview; including Fr. Murray, St. Joachim’s founding Pastor.